You bought the ring, your other half has said ‘yes’ and the wedding day is booked, so it’s time to think about your stag do! Surfing stag dos are not only a radical way to say goodbye to your single life, but a stag do where you learn to surf will give you the unique chance to bond with your pals in an absolutely beautiful part of the world, learn a new sport and enhance your life skills. Surfing stag dos get you out with the elements and we think they are amazing, and you will too. Discover our “dos and don’ts” of surfing stag dos below! Do make sure everyone you’ve invited along to your surfing stag do can swim and that they are happy and comfortable in the water. There’s nothing worse than compounding someone’s fear of the sea by making them don a wetsuit and trying to ride waves if they absolutely hate it! Our instructors are patient and skilled in helping even those with zero surf experience be able to stand up, but if you have a friend who really isn’t keen on learning to surf then don’t pressurise them – let them sit on the beach and film/photograph your surfing stag do adventure instead! Do ensure that everyone is well-hydrated before getting in the sea. Salty water is well-known for its ability to dehydrate and if members of your party are a little in need of hydration from the night before (!) then ingesting gallons of salt water isn’t going to help matters. Make sure that your mates have had a good healthy breakfast to fuel that physical activity, but please don’t eat a fry up right before your lesson as no one likes swimming about in vomit, whether it’s from an old friend or not! Do enjoy yourself! Yes it’s a steep learning curve, but once you’ve stood on that board and ridden your first wave in to the shore you’ll be feeling just like Keanu Reeves in Point Break, and that’s a feeling like no other. Surfing is incredibly liberating – you can really feel at one with the ocean and this type of soulventure stays with you long after you step out of your wetsuit. Memories will most definitely be made with a stag do surf lesson here at Harlyn Bay, and just think how awesome you’ll look on your honeymoon impressing your other half with your cool new skills! Do embrace the weather. Many stag do events in Cornwall are weather dependant, but this isn’t the case with surfing. If you’re worried about rain, then just remember you’re going to get wet anyway so jump in with both feet! The only time a surfing stag do is affected by the weather is when the surf is so big that your safety will be compromised, or if the conditions are so flat that there isn’t even a tiny wave for you to practice on (in this instance don’t worry, we’ll replace your surf board with a sea kayak and you can still get out and about in the water anyway). We also do coasteering and SUP lessons so it’s possible that you can swap in the case of bad surf conditions, all is not lost! Don’t drop in on others! This means that you shouldn’t jump on someone’s wave which is a big ‘no no’ in surfing etiquette. Remember that the surfer who is closest to the breaking wave has the priority. If you see someone already on a wave, then the wave is considered to be taken, and you’ll have to wait for the next one. Not only is it the unspoken rule of the sea, but it will also keep you safe and injury-free! Don’t panic if you get caught in a rip. Hopefully if you’ve followed our instructions this will never happen, but if this does occur then the worst thing you can do is panic. Hopefully you already know that a rip is a strong current that (normally) goes straight out to sea. If you find yourself in a rip, you should paddle across the rip (not against it) until you have escaped to where the waves are better breaking. Don’t drink and surf. Surfing under the influence of alcohol is not a good idea. Save the drinking for the after-surf session at the local pub where you can tell everyone just how many barrels you got. Don’t wear fancy dress. For safety purposes (and so your fancy dress stays dry for the remainder of the weekend!) we ask that everyone wears a wetsuit when partaking in our surf lessons. Don’t forget the sunscreen. Even on cloudy days the UV rays of the sun can be powerful so be sure to apply sun cream to noses, (bald) heads, ears and hands & feet to protect yourself. Don’t forget to bring your sense of humour! You’ll get salt in your eyes, you’ll wipe out and you’ll get sand in places you didn’t even know you had places… and you’ll love it. Come with a smile and a sense of humour and you’ll have the best time of your lives. 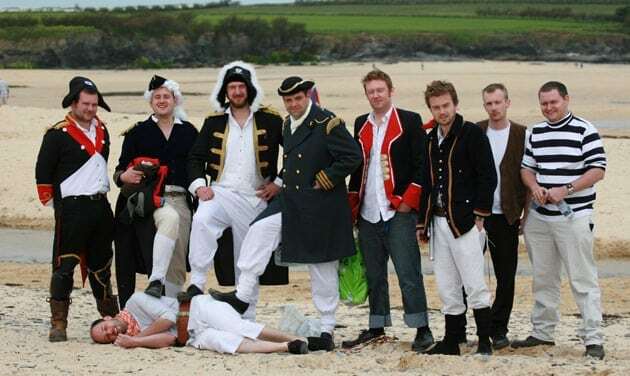 For more information about surfing stag dos in Cornwall please get in touch and one of the team will be only too happy to chat to you in more detail and get you all booked in. We can’t wait to meet you and show you the best stag do EVER!